Was Somebody Trying to Tell Me Something??? ~ A Surreal Experience! 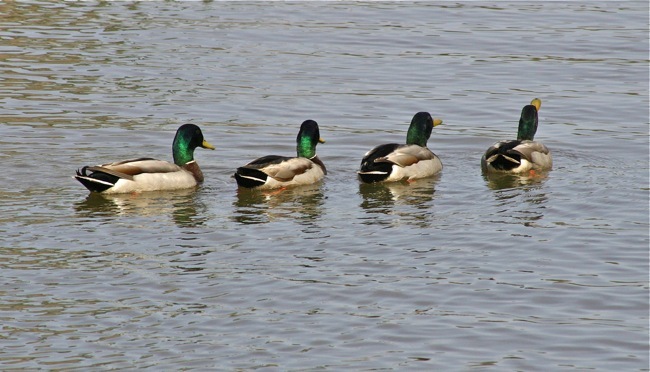 The title of my last blog, Getting My Ducks in a Row, was meant to be taken figuratively. In it I talked about getting organized and prepared for future paintings of waterfowl. Well, the morning I posted the blog something surreal happened to me. I was taken literally! I headed to Newport News, VA to get our car serviced. I left a little early to stop by a pond in case the ruddy ducks were hanging out close to shore. After taking a few shots I got back in the car and headed to Newport News. Along the way, I noticed Newport News Park and made a mental note to stop by on the way home. I had been by the park many times but never really noticed it. As I drove in, I saw a big lake and lots of hiking trails. I pulled into a parking lot and went to see what the little kids were feeding. Hoping for ducks, I was disappointed to see just bubbles from either fish or turtles. I drove around the bend, pulled into another parking lot and spotted a marshy area. I had my camera out with my zoom lens ready and once again hoping for a duck or two. As I approached the water, a noisy squadron of ducks came bombing down into the quiet cove, landing right in front of me! They were all mallard drakes, with beautiful emerald green heads. 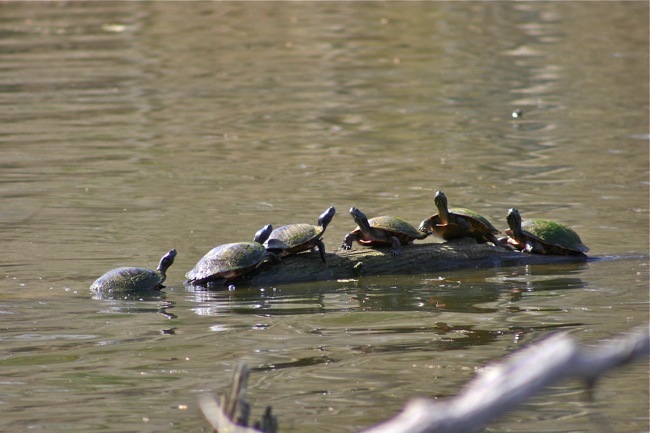 At the very same time, in front of me and behind me, there were rows of turtles lined up on fallen tree logs in the marsh. Hoping the commotion made by the mallards wouldn’t scare away the turtles, I was “snapping” pictures as fast as I could of the turtles in a row and the ducks in a row. Here are some of the pictures I took of the turtles. Excited and amazed by what I just witnessed, I drove around another bend wondering what might be next. 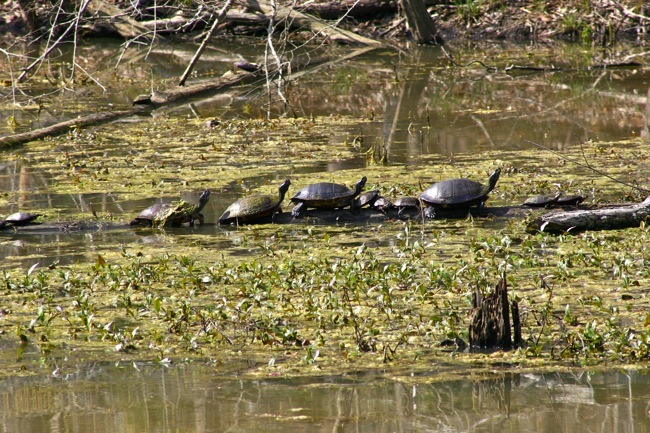 There, along the right side of the road, was a smaller body of water with a fallen tree and the longest row of turtles I’ve ever seen. I took this shot from afar, hoping it would turn out. Check out the big daddy snapping turtle facing the wrong way! While I was busy photographing, a couple of naval fighter jets flying in tandem (row) buzzed overhead. I found this photography outing all very odd, coincidental, surreal and quite remarkable. Was somebody trying to tell me something? Was it a sign from up above, that I’m on the right track? Is it my destiny to become a prolific painter of waterfowl and wildlife or is it all a momentary passion? Whichever the reason, I was so inspired I came home and started a large 30 by 40 inch painting of the squadron of mallards (ironically, the common duck I mentioned in my last blog that I wasn’t sure I wanted to paint!). They were anything but common. They were wild and full of life, having fun in their protected natural habitat. I hope you enjoyed seeing these photographs and that you find them as interesting as I do. My painting is from one of several shots that I took that I think has the “Wow Factor”. It will take a while to complete but I’ll post it as soon as it’s done.